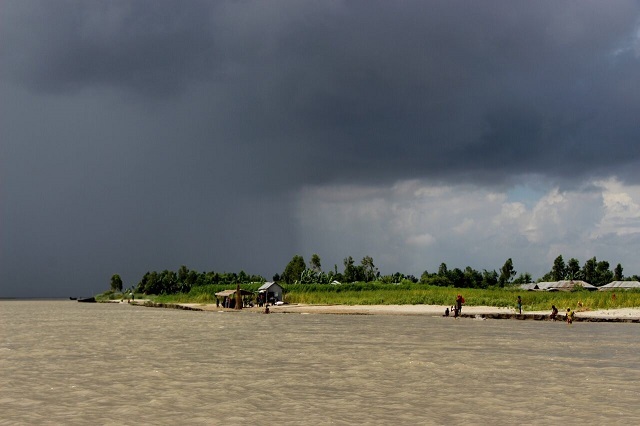 Bangladesh’s Char islands are one of the most fragile ecosystems, which is highly prone to climate change. 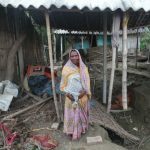 In just one year, Laily Begum, of Chauhali village, has developed a farm using climate-smart practices that can help her cope better with rising temperatures and global warming. She is a role model for the farmers now. “This is Baro Mashi, a local variety of sweet gourd. Can you see those red leafy vegetables in between? Those are red amaranth. Among them, you will find radish and bottle gourd too. Last year, I had a good production of vegetables on my little farm. 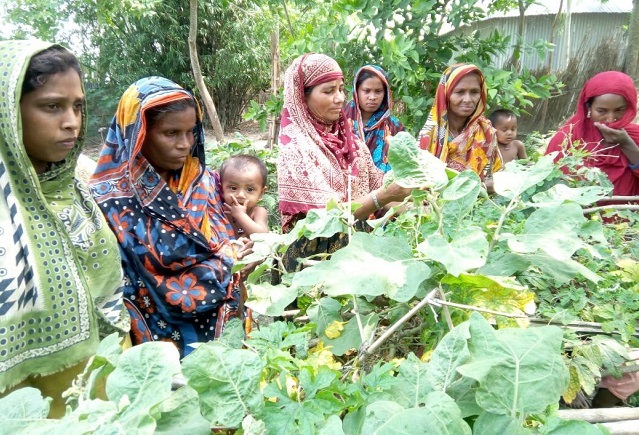 I am hoping to make a profit this time too,” said Laily Begum, while proudly showing fellow farmers around her small patch of land in the village of Chauhali, situated on the Char islands of Jamuna river in the northern Bangladesh, one of the most threatened areas by disasters and climate change. 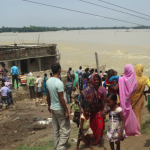 Floods and river bank erosion affect hundreds of thousands of lives in the Char areas annually, displacing inhabitants and causing widespread economic damages. 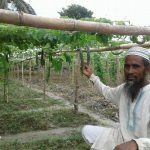 Over the past one year, Laily has been practising climate resilient farming on her 30 decimal (1213 square metre) land in Chauhali, which like any other village on the Char islands is formed as a result of the silt and sand carried down by the Teesta river to Jamuna river from the Himalayas. Known as a role model today, the 47-year-old has found her calling. Twice a week she invites a group of farmers (particularly women) to her farm and explains how through new and yet simple techniques, they can survive extreme climatic conditions such as irregular flooding, river bank erosion and frequent droughts. And this is not all, she added. 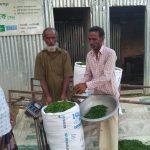 “With unpredictable and erratic rainfalls or drought, which are equally common in the area, farmers often are unable to cultivate their crops as per plan and are left with no regular source of income. So, uncertainty continues,” said Laily. For many, this situation of acute food and finance shortages exists around the year, making them highly susceptible to hunger, malnutrition and poor health. Nutritional deficiencies are commonly observed particularly among women, children and elderly population of this area. 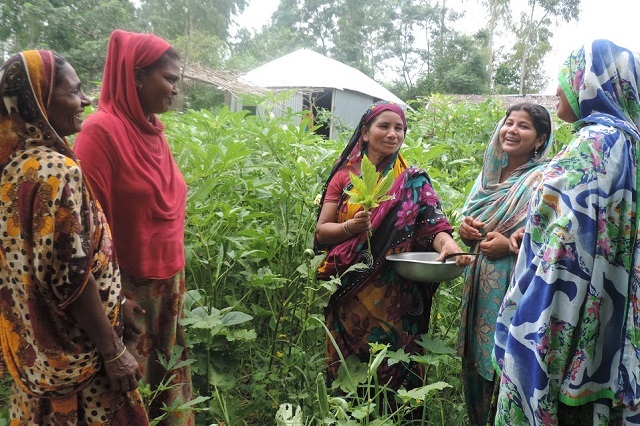 Something that she herself has learned over the past one year through various Farmer Field School sessions and meetings conducted by Welthungerhilfe’s partner Manab Mukti Sanghstha (MMS) in Bangladesh under the Climate Smart Village initiative. “In 2016, a field officer of Manab Mukti Sanghstha came to our village, to have a meeting with us. Just like others in the community, I was curious too to know what he wanted to share with us. So I came to attend the meeting,” recalled Laily. One of the first things the SHG members undertook with the help of the community and the project staff was to prepare a Village Development and Adaptation Plan (VDAP), a tool which helped the community have an overview of the resources and infrastructure available in their village, helped them identify challenges they face and specific actions needed to tackle the issues. “It was the first time that I became aware of our risks and vulnerability and how we can overcome it. We now plan our crops accordingly,” said Laily. For Laily, her association with SHG has opened doors to new possibilities, e.g. training for farmers like her, an opportunity, she never wanted to let go. “I didn’t get a chance to finish my school education. We were four sisters and two brothers. I was the eldest. My family was extremely poor. My father got me married when I was just 13 years old. But conditions after marriage remained unchanged. My husband Md. Toyzal Islam, a fisherman, often had to rely on others for boat rides to catch fishes, which he sold in the market. Despite putting all his efforts, the money earned was barely enough to meet our family’s immediate needs. 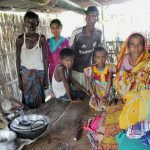 So, when I came to know about a possibility to learn new techniques of farming, I knew I had to attend it,” said Laily, who is a mother of four. She now lives with her husband and two children. The eldest daughter and son are married and have a family of their own. The practice-oriented training focused on raising farmers’ awareness on climate change and equipping them with skills and technologies that enable them to adapt to the changing environment and help them prepare better to withstand pressures in times of calamities. “In one of the initial sessions, I found out about things I didn’t know earlier. For example climate change and its effects, especially on our crop, livelihoods and lives,” said Laily. Soon the practice-oriented sessions became full on. “From discussions on topics such as production and management of different crops using smart techniques to information on specific methods like hand pollination, mixed crop cultivation, floating gardens to sack farming and from seed storage, preparing and using our own compost to using pheromone traps for pest control. We had it all. And each and every method was explained in detail,” she said. Her biggest takeaway from the training was ‘sandbar cropping’, an innovative technique that can enable a silt deposited sandy patch (sandbars) to cultivate vegetables like sweet gourd and squash. 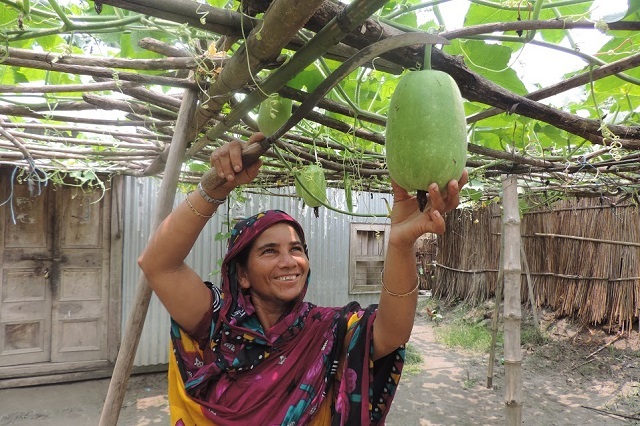 “With the guidance of the project staff, I grew Baro mashi (sweet gourd), using the sandbar cropping. Along the vine, I grew radish, red amaranth and bottle gourd. Five months later, I harvested 4900 kg (490 pcs) of the sweet gourd. Can you imagine that? We were overwhelmed to see such a yield,” she said. And things began to click for her. 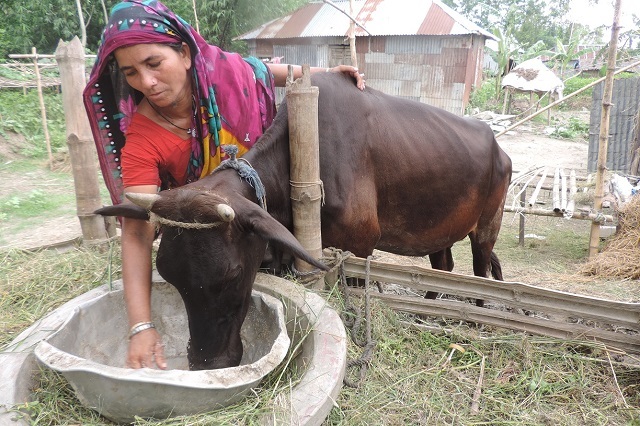 She used the money to buy a new fishing net for her husband and purchased a cow with a calf. The cow gives approx. 4 litres of milk daily, a portion of which she sells in the market. Laily’s journey has been remarkable. So is her experience and learning, which she is determined to share with as many people as possible. As a model farmer, Laily today offers farming advice to individual farmers, mostly women, a voluntary work that she enjoys doing and deems necessary. She is optimistic that the farm will give a further boost to her family income and will inspire other farmers to take up something similar so that they are better prepared to face a disaster, the next time, it hits them. 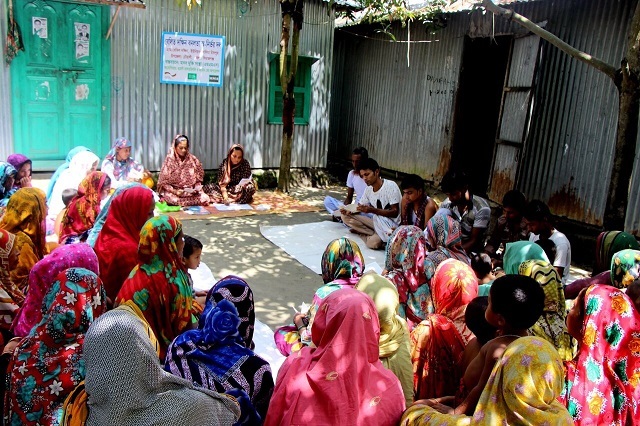 Welthungerhilfe, along with local partners Manab Mukti Sanghstha and Friends in Village Development Bangladesh (FIVDB), is implementing the project `Promoting Climate Smart Villages for improved food and nutrition security’ in Char and Haor regions of Bangladesh, two most fragile eco-systems. The initiative, supported by Germany’s Federal Ministry for Economic Cooperation and Development (BMZ), has been undertaken with an aim to make the project villages climate smart with improved food and nutrition security. The objective is to increase resilience among target households to climate change and strengthen capacities of farming communities for better disaster preparedness. 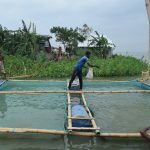 The project seeks to directly benefit 10,000 households spread across 50 villages (25 villages each from Netrokona and Sirajganj districts) from the Haor and Char regions. The project specifically focuses on poor and extremely poor families, particularly women and children who are most vulnerable to the effects of climate change and disasters.